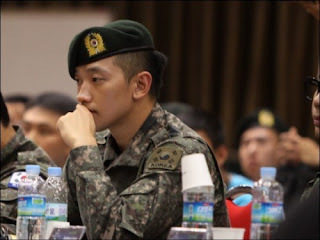 A representative of the military announced after a special hearing that Rain will not receive punishment and finish his military duty as planned. The current controversy the official is referring to is the recent scandal of celebrity soldiers visiting adult massage parlors during their service. Along with reports that Rain and other celebrities receive more vacation days than the average soldier, the issue of special treatment for celebrities in the military have become a hot focus in Korea. The official also announced that the investigation on the other celebrity controversies is still ongoing and that the Ministry of Defense has plans to hold another press conference sometime next week.